Saturday, March 11, 2017, is a day that Ill never forget. I called one of my fishing partners, Marnie Fernandez, to see if he wanted to go fishing. I had a good feeling, so I decided to buy a 50-lb bag of ice and bring my 150-quart cooler. Usually, I would only buy ice for food and drinks, because every time I buy ice for my catch I never hook anything. It was like a jinx. We reached our spot and started setting up our poles and sand spikes. Another friend, Cale Fernandez, pulled up shortly. As Cale got out of his truck, he asked if he could put some sand spikes next to ours. We said, Sure. Cale then unloaded several buckets with live tako that he dove for earlier that week. He changed the water in his buckets and said that he would come back later in the evening. I opened up a cold bottle of Stella as the sun was setting. The moon worked its way up into the clear sky and lit up the poles and the entire beach. We started up the grill, and some other friends, Justin and Jose, stopped by at the perfect time because they had some other local grinds. At about 11 p.m., I recast my pole. It didnt go as far as I wanted it to. I contemplated whether to recast it or not. I decided not to. As I walked about 15 yards away from my pole, I heard Marnie say, Allan, your pole! As I turned around and shined my light, I saw my brand-new, newly wrapped, 131/2 CYO83 bend like Ive never seen it bend before. The fish was pulling so hard that I had a hard time taking the pole out of the stand. Thats when I knew there was something big at the end of my line. I finally got the rod out of the stand and saw my brand-new 60-lb test line peeling out fast. I was trying not to get excited because every time I do, its either a huge stingray or a huge shark. About 10 minutes into the fight I noticed my spool was halfway down and my 80-lb test PowerPro backing was exposed. With about 150 yards left, the fish kept on pulling and pulling and started swimming to the left. I knew that there was reef in that direction, so I slowly tightened my star drag about three clicks on my Shimano Trinidad 40 reel. With about a quarter-spool left, the fish finally stopped pulling. With about 350 yards of line out to sea, I attempted to boost my rod. It felt like I was hooked to a large bungee cord. I wasnt gaining any line. I tightened my star drag another three clicks and was able to gain some line and boost the fish in slowly but surely. About 20 minutes into the fight, I knew the fish was close as my blood knot came through my American Tackle Ring Lock Titanium guides. Cale ran to his truck to retrieve his gaff, because he knew whatever was at the end of my line was big. As the fish came close to the shoreline, I turned my Lupine headlamp on full power. The fish then swam to the right and into Marnies line. With a little teamwork, Marnie quickly freed his line from mine, and the fish went back to the left. As I walked closer to the waters edge, lighting up the shore breaks, Cale waited patiently and scanned the white water while holding the gaff. He spotted a shadow tumble in the white water. With no hesitation, he jumped into the water and sank his gaff into the fish. As the white water slowly subsided, Cale used the water to drag the fish to shore. I was at a loss for words as Cale dragged the fish toward me. As he came closer, the fish got bigger and bigger. In all of my years fishing, this was the biggest fish I had ever hooked. I couldnt believe my eyes! I was in such total shock that I didnt hear my friends congratulating me. I quickly noticed that this ulua was super fat at the mid-section. Cale said, I think get hundred. He then put his hand around the base of the tail (a method he uses to determine if an ulua is close to 100 lbs) to check the gap between his thumb and middle finger. As I inspected my Fluorocarbon leader and Gamakatsu Big-Eye Circle hook, I noticed that the Gamakatsu was hooked perfectly into the corner of the fishs mouth and my pyramid lead was still attached. I grasped the fish by the body and hoisted it up, and the flashes went off. I struck every pose that I could think of. I then realized that my 150-quart cooler was too small so I drove home, only five minutes away, to get my 270-quart Aussie cooler, which Id bought for this particular reason. I grabbed my cooler and manhandled it into the back of my lifted Chevy. I then went into my house, ran upstairs and woke my pregnant wife. When I told her about my catch, I knew that she was happy for me even though she was half-asleep. I quickly arrived back at the spot and placed the ulua into the 270-quart cooler. We then further confirmed that the ulua was in the 100-lb range, knowing that the bottom of the cooler was 55 inches long. 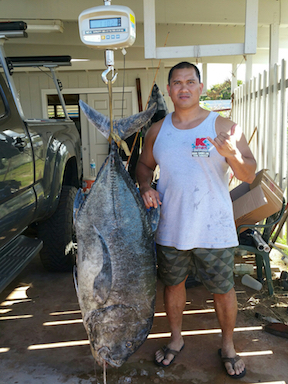 The ulua looked to be 53 to 54 inches in length. The following day, I called another friend, Bryan Hayashi, who held our certified digital scale at his house. When I reached Bryans house, he already had the scale hanging in his garage. As we retrieved the fish from the cooler and hung it on the scale, it weighed a whopping 110.2 lbs and finally settled at an even 110 lbs.